You play this instrument, by laying it in your lap with the tuners pointing to your left. 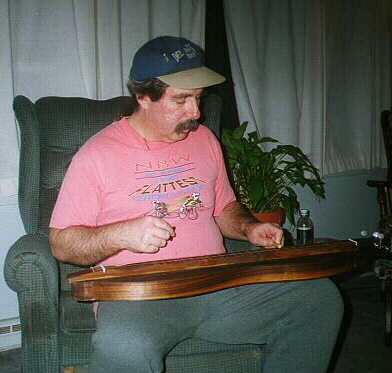 Some people use yarn or a cord around your body and encircling the hour-glass shaped frame of the dulcimer to keep it from sliding off of your lap. 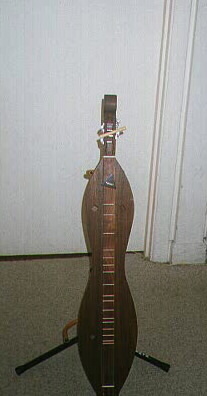 It also has a noting stick, (wooden dowel 3 or 4 inches long) which is used to play the instrument. It frets the notes for you as well as providing a slide sound, (vibrato) which I really like. You can also just use your fingers to barre notes or form chord shapes. 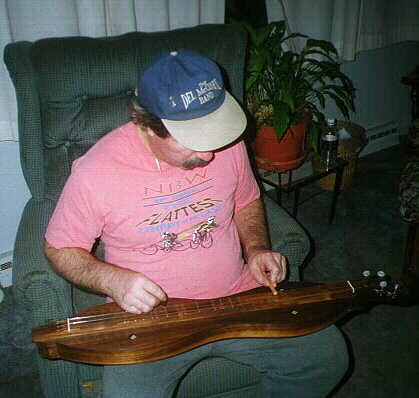 To strum the dulcimer, you can either use a rather large plectrum, (pick) or the back of your nails, or even use finger and thumb picks. You can almost here the strains of "Go Tell Aunt Rhody" wafting out of this beautiful instrument. Is that a Del McCoury hat I see that boy wearing?? ?